Bolton say they are no longer interested in signing Rivaldo. Wanderers appear to have lost patience with the Brazil star, who has also been linked with moves to Celtic, German champions Werder Bremen, and Qatar. "I think as far as we are concerned, the Rivaldo situation is finished," Wanderers chairman Phil Gartside told his club's official website. "He indicated by talking to people in Qatar he is looking at the money aspect, not the football aspect." Gartside added: "We were told he wanted to resume his international career by playing in the Premiership. "But that doesn't appear to be his main focus. He is not going to get that kind of exposure if he goes to Qatar." 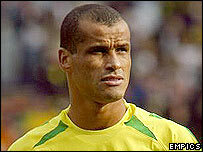 Rivaldo held talks with the Qatar FA on Monday, but it had been thought unlikely that he would sign a deal with them. The 32-year-old had been told a move over there would end his international career. But Qatar FA technical director Manfred Honer claimed: "Rivaldo has signed for us. He has been here for three days and is finding a place to live."